Good morning and HAPPY FRIDAY, loves! For some of you it's like a Monday- The first day back to work after the Snowpocalypse. For others, it's just another National Plum Pudding Day! And DON'T FORGET! The Olympics also begin today! Woop woop! I finally jumped on the Formspring bandwagon! Go ahead, ask me anything. I promise to answer, no matter what! TRUE STORY: 9 things men spend way too much money on. John Mayer is just a huge D-bag... And these are his best... Err.. Worst moments. Miss Ashley Lindley graced the cover of her first magazine! It's a good article for all you fans! Wanna know how to stay in love? This is how. Uh oh! It looks like Reggie kept his engagement promise to Kim! Hmph. Dear Obama, It's time to go GANGSTA! If you want the iPad, I suggest you invest in some of these too. Count me in for a trip to Vegas if this is how taxis are! Just because I love her, it's little Suri Cruise! She's getting so big! 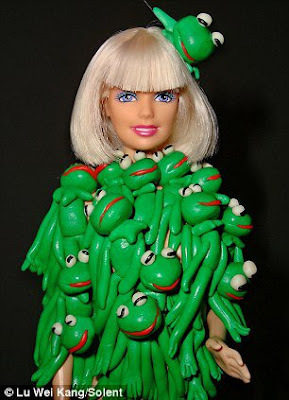 Lady Gaga Barbie?! Perfect representation. I totally thought we had moved past making parodies of "Single Ladies." Ugh. At least this "Scholar Ladies" is funny. I WANT A HOODIE FOOTIE SNUGGLE SUIT! I wish I had a dog that would lead fun chants like a pep rally! This is really freakin' cool. That is all for now! Enjoy your morning!